“401k Plan Sponsors Need to Know the Good, the Bad, and Why TDFs are So Popular,” (FiduciaryNews.com, March 14, 2017) With the pain of the Target Date Fund 2008/09 market crash debacle still lingering in the mind, to best assess the potential fiduciary liability inherent in TDFs – no matter what safes harbors were promised by the PPA – it’s critical that 401k plan sponsors understand what’s good about them, what’s bad about them, and just why they’re so popular. If there’s one thing nature teaches us it’s that the old must erode away before the new can emerge. This occurs in nearly every facet of physical reality. It also occurs in the intellectual realm, too, as organizations, theories, and systems constantly evolve through this cycle of destruction and creation. We’re beginning to see this again at the level of retirement plan vehicles. The last major change was the 40 years ago with the onset of the IRA and the 401k – vehicles which gave individuals more control over their retirement destiny. Only the hardiest dinosaurs (i.e., large company and public pension plans) from this era remain. Large company plans are metamorphosing through de-risking. Public pension plans are imploding. What’s next? “U.S. Public Pension System Faces Many Hurdles,” (PLANADVISER, March 9, 2017) A new study reveals more problems with public pensions. “A new IRA plan could simplify offerings for brokers, employers,” (Employee Benefit Advisor, March 14, 2017) Ron Rhoades offers his take on an enhanced retirement saving vehicle. For one of the first versions of this, see “401k 2.0 – A Proposal,” (FiduciaryNews.com, December 7, 2010). “Can this Government Plan ‘Fix’ 401ks?” (The 401(k) Specialist, March 15, 2017) Chalk another one up on the “plus” side for the Thrift Savings Plan. “Calpers slashes pensions for retirees of defunct agency,” (Employee Benefit News, March 16, 2017) And this from the state that wants to manage private employees’ retirement funds. Warning: Paper can still give you cuts. 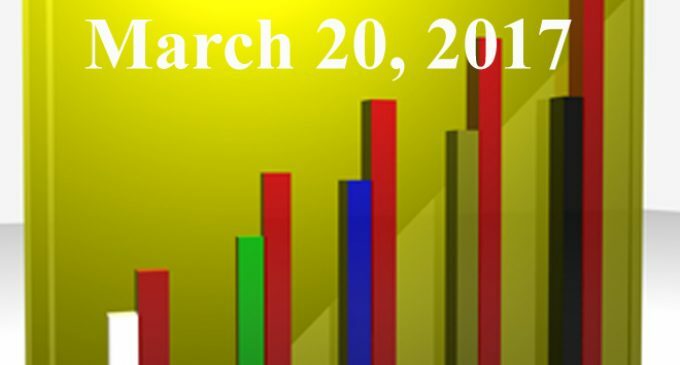 “Get Ready for National Fiduciary Day!” (The 401(k) Specialist, March 8, 2017) fi360 declares March 23, 2017 to be National Fiduciary Day. Dress appropriately. “Labor puts fiduciary rule’s private right of action under microscope,” (BenefitsPRO, March 10, 2017) Here’s the deal: Rule or no rule the flood gates for class actions have been opened. It’s just a matter of whether you’re proving that the breach involves violating a government regulation or whether it involves a greater standard – the entire body of trust and fiduciary case law. This case law exists with our without the DOL’s Fiduciary Rule. Indeed, the argument can be made the DOL to some extent used the theory behind this case law as a justification for the Rule. That’s why you don’t need a formal rule to let loose the lawyers. “Merrill Lynch Rethinks Move Away From Brokerage IRAs,” (PLANADVISER, March 10, 2017) Again, whether or not there is a formal “Fiduciary” Rule, the case law of “best interests” remains invariant. In other words, what could have possibly changed between the time Merrill Lynch original recognized the pre-eminence of an IRA holder’s best interests and now? Nothing. Those “best interests” existed before the DOL decided they should make a formal rule about it and they continue to exist should that rule be rescinded. “Decisions in Tussey Case Not Over,” (PLANADVISER, March 14, 2017) It ain’t over until the last appeal sings. “How to Comply Now With Labor’s Fiduciary Rule(s),” (ThinkAdvisor, March 16, 2017) There’s a reason why author Fred Reish implies there are (or will be) multiple rules. He feels it is certain the DOL, upon further review, will determine the current wording of the Rule will IRA limit access to professional management. As a result, Reish believes the current Rule will be scrapped and a new Rule will be made. Once you learn the trick, the magic is gone and no one will pay to see what isn’t there. Perhaps regulatory ought to stop arguing over how many fiduciaries can dance on the head of a pin and focus instead and forcing everyone to reveal exactly what’s behind the curtain. “Why Clean Data is Critical to 401k Success,” (The 401(k) Specialist, March 15, 2017) This is all about fee disclosure and making it easier to read and compare. What’s old is new again. The challenge is to separate the sizzle from the steak. Sure, getting back to the basics might be good, but marketers do the same thing. Be on the lookout for the difference. “Do Volatility Minimizing Funds Reduce Returns?” (ETF Advisor, March 9, 2017) Their lows are higher and their highs are lower. That’s what you’d want if you’re concerned with downside risk. “What Would A 30-Year Bond Ladder Cost A Retiree Today?” (Forbes, March 14, 2017) Just in time for the rate increases. “Are Risk Tolerance Questionnaires Actually Helpful?” (Wealth Management, March 16, 2017) For a more comprehensive review on this, see “Should 401k Plan Sponsors Ban Risk Tolerance Questionnaires?” (FiduciaryNews.com, August 13, 2013). “Could CITs Dominate DC Space?” (PLANADVISER, March 16, 2017) Yes, of course, of course, we’ve heard it a million times before, CITs are cheaper than mutual funds. Well, there’s a reason for that. Mutual funds are Registered Investment Companies promulgated under the Investment Company Act of 1940. CITs are collective investment trusts promulgated under what ever trust law happens to govern the bank that sponsors them. Oh, and before you say, “CIT regulations are more stringent than they used to be,” try looking up a CIT in Morningstar. Can’t find all the data you’re used to seeing for mutual funds? That’s because there are no consistent regulatory filing requirements.